Recommended VPN: Get the best VPN for travel, ExpressVPN. International travel is now extremely widespread and there are plenty of reasons to be jetting off or crossing borders. But as international travel has increased so has the use of internet-enabled device and with this comes the obvious security implications. Travelling overseas for whatever reason now requires you be a little savvy about what and where you connect your devices. Everything from honeypot Wi-Fi networks in hotels and cafes, unscrupulous users attempting to snoop on your usage and government monitoring are real threats. A VPN is one of the best ways to beat those threats but with more than 500 VPN services out there, how do you even begin to know which is the best for travelling? Well, we aimed to find out and in this guide we’ve rounded up our top five recommendations for VPN apps that will keep you secure while you’re quenching your wanderlust.. or you know, just working (hey, not all travel is glamorous, right?). Why is a VPN useful for travel? The first thing to understand is there is no single ‘Best’ VPN for travelling. Much like there’s no single ‘Best’ VPN for almost any other purpose. There are however a group of VPN services that are better than others. Ranking VPN services individually is incredibly hard and often what is best will depend on your types of usage. High levels of encryption – Even if you’re not 100% sure about what ‘encryption’ is, make sure the VPN service you sign up for advertises at least 256-bit encryption. It’s an industry standard. You should also be looking for services offering OpenVPN, SSTP or Wireguard. If you don’t see these phrases, find another provider. No logs – When you use a VPN all of your connection flows through them. Make sure the VPN service you’re using retains ‘no-logs’ of what you do while connected. Or at the very most, stores only minimal logs for the shortest time. Don’t be afraid to quiz the VPN provider on their logging practices and ask for proof before handing over your cash. VPN server locations – Check that the VPN service you sign up to has servers either in the country you’re travelling to or in nearby areas. If you’re going to India for example but the nearest server location is the United States you’ll likely have a very slow and unreliable internet connection. We’ve listed our top five VPN services best for international travel below. However, it’s worth remembering that although ExpressVPN is our top pick, there may be some features of the others that are more suitable for your needs. So if you’ve got time, it’s worth checking them all out individually. Click on any of the names above to go directly to the round-up of their service. ExpressVPN is one of the industry’s leading VPN services, so much so that we gave them our Editor’s Choice award the last two years running. For international travel they make the best choice due to their extensive range of VPN servers. These connection points are available in some 94 countries across the world making them suitable even if you’re the most well-travelled traveller. They also work well in countries with restrictive internet regimes such as China. In our recent best VPN for China study, we found them to offer the fastest and most reliable connections in China. Another positive feature of the service is its range of apps. Offering apps for Android, Apple iOS, Windows, Mac, Linux, Fire TV and many more, there aren’t many services that compete. It means whatever type of device you travel with you’ll be able to connect without wasting time setting things up. OFFER: Get 3-months free on a 12 m package. Use the orange button below. The service claims not to log any of your data while connected which has been tested and they have a 30-day money back guarantee so you can check it in many different circumstances to make sure it’s suitable for your needs. VyprVPN is another longstanding VPN service that has built up a reputation for offering a fast and reliable service. They have VPN servers in some 70 different locations. Aside from central and southern Africa most of the world is covered so regardless of where you travel you’ll be able to find a VPN server nearer enough to provide a secure and fast connection. We like VyprVPN’s apps because they are some of the most user-friendly available. Plus they’re available for major devices including Android, Apple iOS, Windows and Mac. TIP: If you’re looking for the best Android VPN check our dedicated guide. The service recently became a fully no-log service so what you do while connected remains private. VyprVPN’s claims were also audited so you can be safe in the knowledge their claims are sound. They don’t offer a money back guarantee, but you can get a completely free 3-day trial. Pop your payment details in to take advantage of this – remember to cancel if it’s not the service for you. 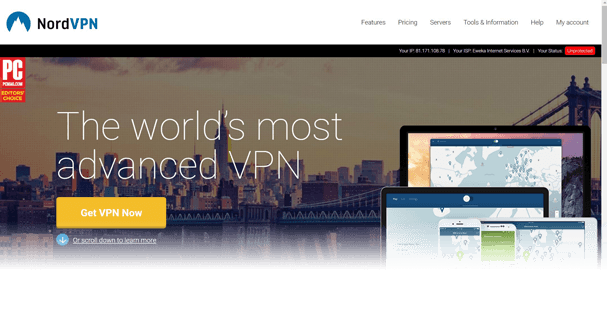 NordVPN has firmly set itself as one of the best VPN services and for travellers, they’ve got some neat features that make them stand out. VPN servers are available in 61 countries but what stands out is there are over 5,100 individual VPN servers. This is a considerable number and more than most VPN services. With so many servers you’ll have no trouble connecting in any country. Like most services, they are a little thin on African coverage but everywhere else is well catered for. The apps are well designed and easy to use. You can connect using either a world-map or if you’re not great with geography they have a country list or ‘best server’ option to connect you quickly so you’re secure with minimal interaction. Prices of the service are very favourable. For example, a 3-year plan costs from as little as $2.99 (~£2.30) a month which will allow you to stay protected for the foreseeable and if you travel a lot will help you stay secure online without breaking the bank. There’s a 30-day money back guarantee available too which will give you plenty of time to test it in numerous locations on different types of internet connection. VPN.ac is one of the best all-round VPN providers, so it makes sense that they’re great for use for travelling too. If you’re an international traveller though you will need to check out VPN.ac’s location list first. Although they cover over 20 countries in North America, Europe, Asia and Australia they don’t have servers in every region. It pays to check before you sign up. If they are suitable for the kinds of countries you travel to, then you’ll be rewarded with a super fast, highly-secure VPN service. In fact, in China where they have restrictive internet, they’re one of the best – and fastest! If you value encryption then the high-levels of encryption plus rare and experimental modes will be right up your street. It’s one for the techies but even if you’re a beginner their range of apps which work with Android, Apple iOS, Windows, Mac and the Amazon Fire TV devices are easy enough to use. There’s a small 7-day money back guarantee but if you value your privacy and you’re after something a little different then this is the service for you. IPVanish is another long-standing VPN service that has established itself as a leader in the market. For travelling they make a great choice because they have somewhere in the region of 50 countries covered. This includes most locations around the world, again Africa is under-resourced and that’s a common theme across most VPN services. They’ve got apps for all the most major devices so you can secure yourself on both your mobile devices or your bigger portable ones such as laptops or even desktops. Choosing a server to connect to is quick and painless either via map view, a list or even by filtering to your preference. We like their 256-bit level of encryption and you can use the service on up to 10 devices at the same time keeping all your devices secure while you’re on the move. Sadly, they don’t work well with Netflix, BBC iPlayer or many other popular streaming services so if TV content is what you’re after you’re better sticking with one of the earlier providers. Above are our five top recommendations for VPNs for travel. You can either pick our favourite, ExpressVPN or any of the other four listed – they’re all suitable so no need to fret. There are however some reasons why you might want to choose one over another. So we’ve broken it down into usage types. If you’re still struggling take a look at the types of usage scenarios below that will help you narrow it down. If you’re a world traveller, digital nomad or globe trotter, get ExpressVPN. Without question with 94 countries supported they’ll allow you to stay secure no matter what country you end up in. If you visit countries with restrictive internet, get ExpressVPN or VPN.ac. If you travel to China, Turkmenistan or other countries with less open internet, these two are your best bets to unblock the net. If you want ease of use and reliability, choose VyprVPN. Their apps are some of the best we’ve seen, well designed and quick to connect. If you want to try without risk, sign up for NordVPN. They’ve got a 30-day money back guarantee to give you loads of time to test their service – Failing that, VyprVPN has three days of totally free full-service access. If you travel with more gadgets than you’ve got space for, take IPVanish. With a ten concurrently-connected device limit, you’ll be able to secure more gadgets than you can carry. In most countries these days there is some form of monitoring of what you do on the internet, couple that with security threats it’s a good idea to be using a VPN all the time. When travelling this usefulness increases ten-fold. You’re more likely to be connected to public Wi-Fi networks in hotels, restaurants, cafes and other insecure locations. It’s not a new problem nor is it one that’s gone away. In these articles from 2014 and 2017 hotel Wi-Fi was found to be insecure and even spying on user’s activity. A VPN will protect you against such threats. Travelling means you’ll inherently be connecting and disconnecting to different networks rather than staying continually connected like your home network. Use the Kill Switch – Using the internet while travelling will see you connect to all sorts of unreliable internet connections. If your VPN service offers a ‘Kill Switch’ – use it. You’ll find it in the settings area. It’s a safety feature that will cut your internet if the VPN connection drops. Try different ports or protocols – Some public Wi-Fi (especially Airports) don’t work well with VPN apps. Head into the settings area of your VPN app and change VPN ports or protocols. Some useful ports that usually work include port 80, 443 or 8080. Start with the OpenVPN protocol but also try SSTP, L2TP and WireGuard. Steer clear of using PPTP in all but the most extreme circumstances. Sign up before you leave – In countries like China even accessing a VPN service’s website is blocked. That means you’ll struggle to sign-up. Make sure you sign-up AND download any VPN apps before you leave home. They’re just a few of our top tips on how to use your VPN safely when travelling but if you’ve got some favourites let us know in the comments section below. Software and app-based VPNs are excellent tools but if you travel far and for a long time it’s worth investing in a portable VPN travel router. One of the best is InvizBox Go. 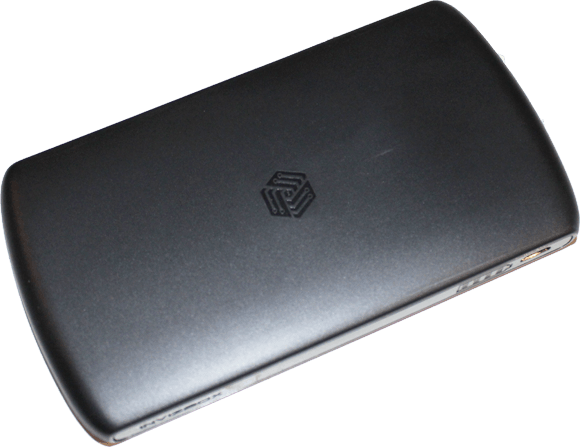 It’s a small handheld-sized device that handles the VPN side of things for you. You connect your device to the InvizBox Go and the InvizBox Go to the public Wi-Fi network. Any device connecting to the InvizBox Go is then secure. One of the significant benefits is there is no information leaking when connecting. With software and app-based VPN services you can leak data in the time between turning on your device and getting connected. As many apps automatically start to send data as soon as you connect this can be more data than you would think. Check out our VPN travel router review of the InvizBox Go if you’re interested to know more. Whether you’re travelling for business or pleasure keeping your internet connection secure is just one more headache. A VPN is one of the best ways of taking the hassle out of this. We recommend using ExpressVPN because their combination of a wide range of locations, a good selection of apps and good speed results mean they’re the most hassle-free service when travelling. The other four options all make good choices in their own rights, so there’s no right or wrong decision. Whichever VPN you end up choosing make sure you remember to switch it on and always connect when using public Wi-Fi networks. Have you had experience of using a VPN when travelling? We would love to hear your thoughts so why not pop a comment in the comments section below. Get 3-months free! Try our recommended Travel VPN service.